A game is just a game until it’s Gigantix! Dynamix transforms your favourite board games into physical life-size challenges that require superior team effort. Leave your instruction manual at home, because these games are one of a kind. Are you game? Bring classic board games to life! 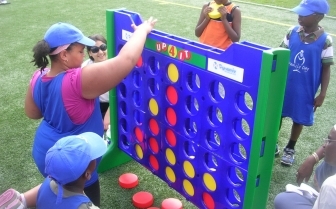 Trying to get 4 in-a-row is hard enough... make the game board 4' tall and add zipline devices to transfer pieces to your teammates to place them in the game board and you have Extreme Connect-4!!! If you think Jenga is fun, just wait until you try playing with a giant pieces that make the Jenga tower way over head. Your friends are the game board and they are waiting to make the game board explode! It's a race against time to try and get all of your pieces in the right place before everyone POPS!